Mentoring Moment with Dr. John Marshall ’76 is the first in a video series from The Lexington School’s Alumni Network. There are thousands of successful Lexington School alumni all over the world who have valuable stories to tell those TLS students and young alums who aim to follow in their footsteps. Why not take a few minutes for some very good advice? That’s what Mentoring Moments are all about: connecting the knowledge, experience, and relationships bound by The Lexington School’s sustaining community. Dr. John Marshall ’76 is trying to save lives. He’s worked to save lives his entire medical career. When he can’t save them, he does his best with medicine, psychology, spirituality, and above all EMPATHY to make a difference somehow. Objectively, John has an esteemed career in medicine. You can read the impressive details of John’s work and accomplishments on the Ruesch Center for the Cure of Gastrointestinal Cancers website where he is the Director, where he has been the principal investigator of over 150 clinical trials, at the local as well as national levels. 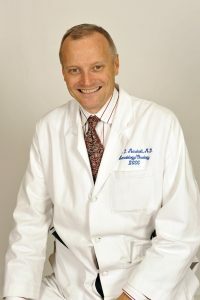 Additionally, Dr. Marshall is the clinical director of oncology for Georgetown University Hospital and chief of the Division of Hematology-Oncology. There is little we can write to capture Dr. John Marshall’s experience and charisma in this Mentoring Moment. Please take five minutes to watch and learn. We guarantee you will get something out of it. In fact, if you watch the entire episode, John has a special offer for TLS alumni interested in studying medicine. It is time well spent, and it is just for you.